At Crescent Design and Construction we know that making the decision to add a pool to your property is a big yet exciting step. It will provide you and your family with countless good times and enjoyable memories. A pool installation is a large process so we would like to lay out what the pool construction process is like so that you know what to expect and so that you can also be fully prepared! Step 1: Have your free in-home consultation with our master contractor to discuss the location, timeline, design and budgetary details. Step 2: A custom design will be drawn up based on your preferences and will need your approval. Step 3: A contractor will then come to your property and place stakes in the ground according to your pool design. When the staking is finished you will be able to visually see the outline of your pool and the location of where it will be installed. This step will also need your approval. You need to be sure at this point because this is the last step before the excavation takes place. Step 4: Exciting excavation time! This step generally takes one whole day to complete. Unless advised differently, our construction crew will remove all of the soil and any waste associated with it. Step 5: Plumbing. Depending on your situation this step will either as step 5 or will happen after the pool shell is made. Our licensed plumbers will install the proper equipment that will keep your pool clean and purified. Step 6: Steel Rods: Steel reinforcing rods will be placed inside of the excavated area, covering the bottom and following up the sides of the pool and ending in the bond bean, around the skimmers. The steel reinforcing rods add the structural strength and integrity for the shell of your pool. Step 7: A detailed inspection by our project manager and master contractor will take place. We will also be responsible for scheduling any city inspections that will need to be done required by law. Step 8: The pool shell is placed. 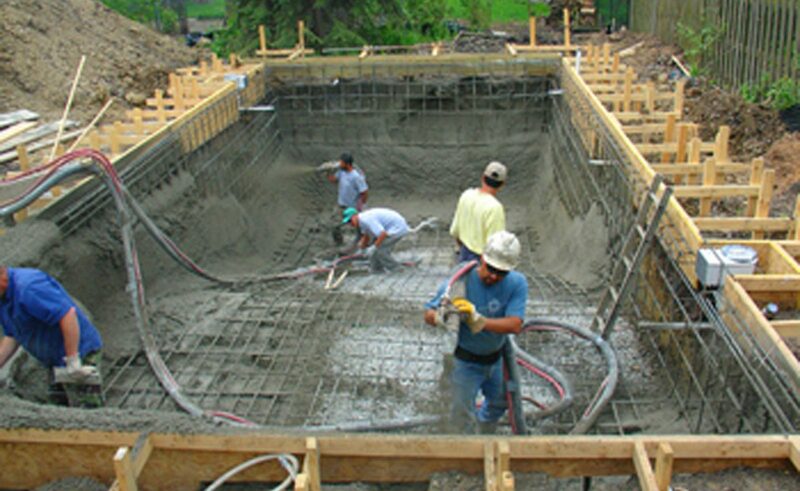 To create the pool’s shell, a concrete mixture is sprayed with great force around the steel rods. This step creates a concrete and steel base for your pool. Step 9: After spraying the concrete to your pool, it must be cured or set. In order for the pool to set the fastest you will be asked to spray a light layer of water from a hose on to the concrete several times a day for one week. This further adds to the strength of your pool. Step 10: Next, the trim or coping of your pool will be installed. Some materials to choose from are brick, concrete, or stone. You also have the option of simultaneously installing a pool deck that extends right to the edge of your pool and in this case you would not need coping in this area. Pool desk options with Crescent Design and Construction are: concrete, tile, pavers, stone, wood, brick, slate, flagstone, and rubber. Step 11: The tile is laid along the waterline! We will give you a wide variety of tile options to choose from. Step 12: Our electrician will hook up your filtration and lighting system. To do this our licensed electrician will hook these up to your main electric service set up. Then a final inspection of the electrical work will have to be performed. Step 13: If you have chosen to have a heated pool, our experts will install gas lines. Step 14: Your pool deck (if not leading straight up to the pool edge) will be installed. Step 15: Installing a fence. We will go over fencing options in the beginning but most cities require a fence with a latched gate be installed. We will make sure that your entire pool project follows all the city requirements and restrictions. Step 16: As one of the last steps is the pool finish. Our contractors will apply a waterproof finish over the entire surface of the pool. This will seal the pool. Step 17: Pool start up demonstration. You will fill your pool with your garden hose or whatever preferred method you decide to use. Our staff will show you how to turn on your pool system, how to work all of the equipment, show you how to take care of your pool, and what products to use. The next step is to enjoy!